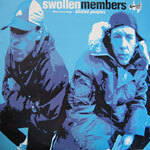 This is a really dope 12 inch by Swollen Members. Taken from the debut album, 'Balance' this is not one to sleep on. A side produced by the Alchemist. Vocals by Madchild and Prevail. B side produced by Evidence. Vocals by Iriscience, Prevail, Evidence and Madchild. Cuts by Kutmasta Kurt.